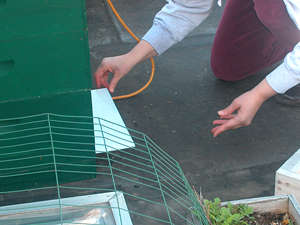 I may have a varroa mite problem at midwinter: then again, I might not. 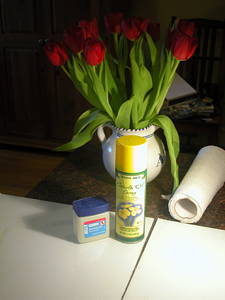 There's only one way to know — I have to get a mite count. 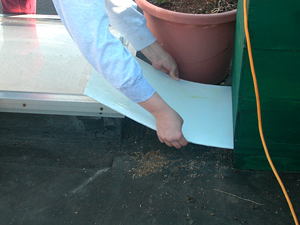 Some beekeepers do this using a technique called the ether roll, or a similar one called the "sugar shake." Both would require that I sacrifice bees. Luckily, the easiest way of all to count dropped mites is available to me! It's called a sticky board. In any case, the measurement depends on getting a statistically significant sampling of either mites-per-jar-of-bees or of dropped-mites-over-time. An ether roll or a sugar shake would have me put 200 bees in a jar with a screened cover and either pour in ether or cover them with powdered sugar, then shake the jar's contents over a clean surface (or bowl of water) and count the mites that fall out. Then I would argue with another beekeeper over whether the numbers meant anything. With a sticky board, I just put a board with a sticky top surface under the hives for three days, pull the thing out, count mites, divide by three, and then ask someone what the number means. The reason I can use a sticky board is because I bought the right equipment to start with (hey, I can be opinionated, too). 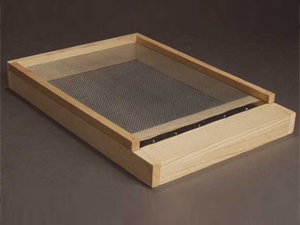 The boxes of my hive rest on something called a "screened bottom board" or "SBB," a piece of wooden gear with an open rectangle in the middle that is covered with something like window screen (the picture at left is an SBB copied from www.dadant.com). Mine has a slot that lets me insert a plastic board under the screen in order to control air flow and to catch stuff, like dropped mites. Above right, you can see how the inserted board slides in and out of the bottom of a hive. When they first came out, my boards were FILTHY, understandable since they had been in since October. I could see mites, but it did not look overwhelming. The dirtiest board came from the Wilde colony, and it appears that great big blob you can see below at left is the remains of the grease patty I gave them. Looks like a thumbs down, eh? Twain's board was really clean in comparison: those girls will eat anything. I brought the boards down to the kitchen to give them a good scrub: they are made of corrugated plastic stuff that can take such a beating. 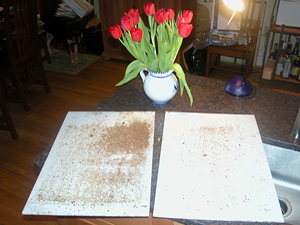 It's important to clean them really well, in order to make it easier to count the tiny mites later without being confused by propolis dots or random stains. By the way, they smelled great while I washed them. There is an alternative to all this washing and scrubbing. You can buy boards that come with a sticky top surface (like the back side of contact paper) and are printed with a grid, for easy counting. I thought about marking lines on my boards with an indelible ink marker, but decided against it due to time and to potential smearing. 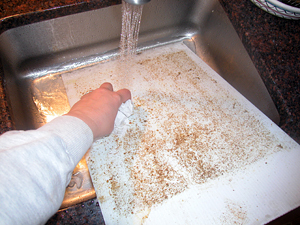 A sticky board is is also sticky enough to grab and suffocate mites if you use enough oil, instead. The mites fall down and find it hard to move in the slippy slide-y stuff, and the oil eventually seeps into and clogs their breathing holes. I tell myself that suffocation could hardly happen to a nicer bug. I know that this sounds inconsistent with my general pro-critter policy, but what happened with Varroa is that they jumped from a place where they occupied an established niche into a world with no checks or balances for their actions. However beneficial they may have been when they started, they have become angels of death for the bees and the environment at large. Feel free to draw any political parallels that suit you. 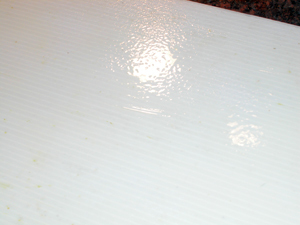 The photo below left shows you how the surface of the board looks when prepared using this goopy mix. The boards are not dripping, but every inch is covered in slippery material. On the right, you can see how the board was inserted back into the Wilde colony — I have some space issues with that particular area of my roof, and I need to give this a bit of thought. Some of the oil was scraped off during the manuever, and some dirt from the hive body may have been smeared on. The picture at the very top right is actually the (much easier) reinsertion of the bottom board for Twain. So in three days I will return, pull them out again, get out my magnifying glass, and count. Please, if you love my girls at all, petition your chosen Ultimate Authority that this may turn out to be a silly fire drill.